In this post, following the same approach we took with the Android application, we will create a tabbed container page for the iOS application as the Hub view of the application. Using the MvxTabBarViewController implementation we can easily create the main container. This UIController implementation exposes a property (i.e. ViewControllers) in order for us to push the child view controllers. Using the sample method from the N-25 sample of @slodge for MVVMCross, we can easily generate the view controllers for child views using the data passed into the container viewmodel (i.e. HubPageViewModel). This ought to be enough to generate the child view for a given view model. However, we do not currently have a view model for the groups view. If you remember from Windows Phone and Anroid implementations, we never had to use a view model for the group items view; we used the Groups property of the HubPageViewModel. In order for the view controller to be generated for the groups list, we can wrap the list into its separate view model and expose it through the HubPageViewModel. As you can see, we are passing in the parent viewmodel and exposing its groups through the Data property. We will also need to utilize the SectionPageViewModel which was previously used in our Universal app sample for Windows. It was taking a SampleDataGroup item and loading the items for this group using the navigation parameter that was passed in. However, in our case, we will not be able to use the complex navigation parameter, since it will be loaded into the view from the hub view. So let us overload the constructor with the selected item data. NOTE:Init method was the method that was being called by the navigation service to pass the complex object. Looking good, so now we “just” need to create the views for these two view models and we are done with the hub view implementation. 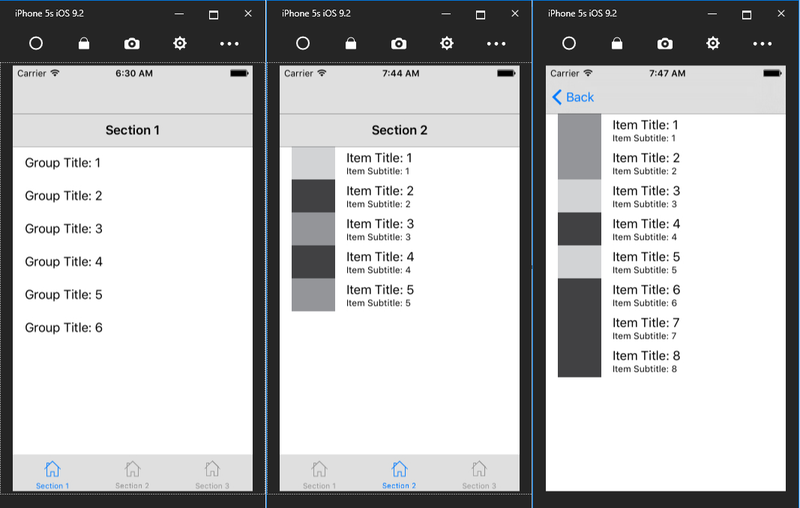 MvxTableViewController base implementation exposes a TableView (of type UITableView) property which we are responsible to bind to with data items using a TableSource as the adapter. Additionally, while setting up the TableSource, we can introduce our custom cell style or can use the standard cell styles. For the first page of the HubView, we will be using a standard MvxStandardTableViewSource which supports the basic views including a title only (UITableViewCellStyle.Default) and for the group detail pages, we will use the image with subtitle text view (UITableViewCellStyle.Subtitle). Notice that the last parameter we are passing is the binding description (“swiss” binding style) for the TitleText property of the default cell item. Once the table source is created, we can create the data bindings for the table source and the navigation command. We will be binding the navigation command to the SelectionChangedCommand property of the table source. 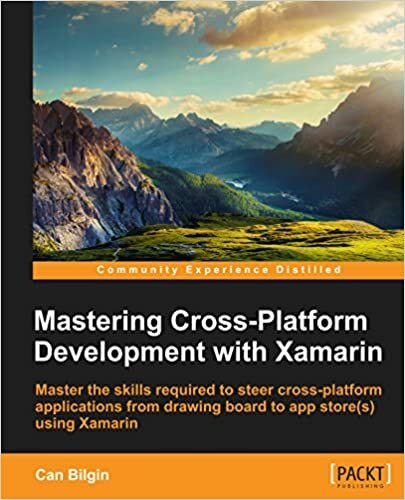 NOTE:It is important to mention that on iOS platform with MVVM Cross, sometimes the ViewDidLoad method is fired before the view is actually constructed and the ViewModel loaded. In order to avoid null reference exceptions, a workaround would be to call the ViewDidLoad method in the constructor and create the table source and bindings only if the ViewModel is loaded properly. So now we will need to create another table view controller for the second and third section pages using the first and second group items. All seems ready to go but we will need to add the image resources to the project and write another value converter to able use the ImagePath returned from the data items. If you remember from the previous source, they were returned with the parent path operator (‘../’) and the folder name ‘Assets’. We had to trim these values for Android since the images were included as ‘AndroidAssets’. For iOS, we will include images with the BundleResource build action. Once they are included in the bundle, the images can be accessed by the MvxImageViewLoader using the “res:” prefix. So using this information, our converter would simple replace the parent path operator with the “res:” prefix. Now we can edit the binding text that we used for the SectionPageView table source. "TitleText Title;DetailText Subtitle; ImageUrl ImagePath,Converter=AssetsPath"
NOTE:Here we must mention that AssetsPathConverter class is registered as AssetsPath in the reflection sweep done by the MVVM Cross, if we named the converter MvxAssetsPathConverter or just AssetsPath; it would be registered by the same name (i.e. “AssetsPath”). You can read about referencing the converters and UnconventionalAttribute on the wiki page. Putting all these views together, we would create the view controllers for the groups view model and two section view models and push them to the ViewControllers property. Now we have both of the views generated and inserted into the hub view according to our needs. The first image is the groups view that displays the list of groups, second one is the list of items contained in the group 1 displayed as the second section of the hub view. Finally third view is SectionPageView that is generated when the user clicks on one of the group items on the first section of the hub view. Let us finalize this post with this screenshot. In the next, we will create an addendum to our Bonus: Item Level Command Binding post, trying to implement the actionable cells on iOS table view.